Sogaimiti is the premiere club and organization within the United States promoting traditional and authentic Samoan tatau (tattoo) culture. 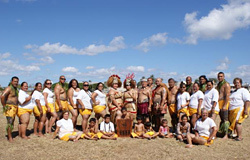 Its members are Samoan men and women of all ages who have all received the full body tattoo through the traditional Samoan methods which date back hundreds of years. It is these traditions which they strive to maintain in these modern times to uphold their history, culture and pride. Their mission is to develop future leaders, mentor the youth to become self-reliant and contributing members of society and to always lead by example by embracing the values, customs and responsibilities entrusted to them through their traditional tattoo.